“We’re all made of stories. When they finally put us underground, the stories are what will go on.” Charles de Lint, contemporary fantasy author. I love stories, to tell them and to hear them. When I’m in a particularly uncomfortable situation, I tell myself that once it is over it will make a good story, and usually it does. I like to hear friends’ horrible experiences too. Misery loves company and all, but others’ stories also help me think about how I might handle the situations they describe (usually not as well as they did). Unlike Stone Age people, most of us live routine lives: wake up, satisfy our morning caffeine needs, get ready for work and go. A good story takes us out of this everyday world. It’s fall, time to sit by the fire with a glass of wine and share stories. This week, a friend named Lydia told me one about her first two weeks in a new job, which I’m going to share. Lydia spent her entire first week at a public relations firm going through training. Not the “here’s your desk and your job description and our code of conduct” kind of training, but rather, a full education on the topic of silicon implants. Yes. Really. Here’s a little about what she learned. Silicone is a rubber-like compound used for many purposes, including by plastic surgeons to build up biceps, pectoral muscles, breasts and a male body part. 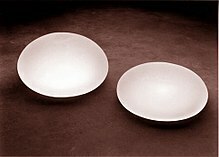 In 1992, the Food and Drug Administration “banned these implants for general consumption” as a result of hundreds of women who’d had breast implants complaining they caused cancer, autoimmune problems, and other medical issues. For her second week on the job, Lydia got to attend a plastic surgeon’s convention. There the keynote speaker, who was head of the corporation that made the implants, announced that the ban had just been put in place and then immediately skipped out of the conference. Anticipating an unfriendly response to his speech, he also left his own firm’s PR people at home and left hundreds of plastic surgeons in a state of despair, because they had a full schedule of implants on their calendars and feared they would not be able to get the product in time. (I keep wondering why they didn’t have a teensy bit of concern for the safety of the women they’d already done surgery on or were about to cut, but apparently that wasn’t their issue). My friend and her new colleagues — now suspicious their primary role was as cannon fodder — spent hours trapped in an information booth trying to appease these unhappy plastic surgeons. I suspect the plastic surgeons were less impressed with my friend’s and her colleagues’ new knowledge about implants than with their total inability to resolve the problem. The biggest surprise was that my friend stayed with the firm after her trial by inferno, but she did. Maybe she figured the job couldn’t get any worse. Do any readers have horror stories from their first days/weeks on the job stories? If so, please share. I’d love to compile them into a blog or two. I agree, it’s a horrible situation to land into. So glad she survived and can tell her story and maybe even laugh about it! Wonder what was so good about the position that it caused her to stay. I would have run for the door immediately. She was young, innocent, had no idea that it would be so awful. I don’t know if I would have run back then.